"Codes that power DevOps projects don't write themselves. People write those code"
"Without people powering our initiative now, we are just a few guys with a bunch of code and tools that are irrelevant"
Boom! These thoughts hit me like lightning and in that moment I felt and equal measure of wisdom brought by this realisation as well as disgust at my stupidity of forgetting one of the main tenants and requirements to make the dream of a successful DevOps project a success. I was reaching out horizontally to push our agenda across. Developers loved what we proposed and that was pretty much it. It's cool and it's cutting edge. It stopped there. "Hey thanks for sharing that cool tool ! I will try it in my project when I get the chance!" is pretty much the maximum you can expect to get from such an exchange. For you to gain any traction, you have got to sell your proposed solution or improvement to the stakeholders or the decision makers. Efforts that usually require people to do the right thing or go out of their way to do some unplanned kindness or rightness usually results in zilch. I did not try to see the tool that I was proposing from the eyes of the beholders. It was too much of a leap. Much like how Abraham it's impossible for you to frog leap from sadness to happiness, so it was how the developers felt. They knew it was good for them, they can see it was good for them, they felt it could have the potential to improve their lives but alas they did not internalise it. The proverbial light bulb did not turn on inside of them, more correctly said, I did not do enough to turn that light on. I could see some people opening up, but when this realisation hit me, I just ended the meeting. I have not done enough of understanding where these people that I hoped to implement DevOps were. I had to do that first. Do I miss coding ? Do I miss hunkering down and prototyping my way to showcase a tool or to get something to work ? Of course! Who wouldn't but main thing I keep on going back to is ... what is the main goal and expectation of the people who hired me to lead their DevOps push ? Is it to wire together some tools and configure something so they can use it ? At small enough scale probably that is enough of value, but when you want the horses you lead to the puddle to drink you need to give them a reason and just because you are drinking, you can't expect them to follow suit. The lot of advantages of web development using python Django framework can be easily accessed in small project, better security, less effort and less investment money into a projects. Miguel Grinberg, one of the boothmates, is doing his First Steps in Web Development With Python tutorial Thursday morning, 9AM to 12:20. He’s fantastic at this and a real icon of PyCon tutorials over the years. Thursday afternoon at 3:30 I’m doing 42 PyCharm Tips and Tricks in Room 13. It’s a hands-on workshop with a secret twist which I’ll reveal at the event (and after.) We’ll have some of the PyCharm team with me to help folks in the audience with questions. PyCon’s opening reception starts at 5:30PM on the show floor. It’s got food, it’s got drinks, it’s got…our packed booth with lots of stuff going on. Come meet ten of us from the PyCharm team, along with the Content Creators: Michael Kennedy, Brian Okken, Dan Bader, Miguel Grinberg, Matt Harrison, Anthony Shaw, Luciano Ramalho, Bob Belderbos, Julian Sequeira, and Chris Medina. Perhaps even a FLUFL sighting. Come meet the PyCharm team! We’ll have ten of us, most from the core team. We go to events not to do sales but to listen. (Some might say, face the consequences of our decisions.) Want to talk to the main developer of our debugger? She’s there. Ditto for the new Jupyter support, vim emulation, etc. Or if you just want to say hi, then please come by, take a picture and tweet it, and get a retweet from us. Podcasts, articles, video courses and training, books…as the previous article mentioned, we have a home for many of the key Python “content creators” to share a presence, use the mini-theater and one-on-one space, and just hang out and have fun. There are two stands for them to share in timeslots throughout the conference. We’ll make the schedule available closer to PyCon. But they’ll all be around for the reception. This is the second big addition this year: booth space for small talks, both scheduled and impromptu, by the PyCharm team, the Content Creators, and even by some others. We’ll announce this in detail later. Not just talks…we’ll announce some special events as well. The PyCharm booth will have a dedicated area along with the conference miracle of seating, where we can work one-on-one. Bring your laptop “into the shop” for diagnosis. Show us some big idea you’ve been working on. Get a tour of some PyCharm feature that interests you, from the person that implemented it. This also applies to the Content Creators as well. Saw an article or listened to a podcast and want more? Pick a time to meet up with them in the one-on-one area. Did I mention seating? We have a crew hanging around different times at the booth, doing interviews and producing clips. If you’re around and want to give a shoutout to PyCon for the hard (volunteer!) work putting on a great show, let’s get you on camera. For the purposes of this tutorial, you will be using the latter. When you start out using an unfamiliar API, it is always best to begin by reading the documentation for that interface. Another approach would be to do a quick Internet search and see if there is a Python package that wraps your target API. Unfortunately, there does not seem to be any maintained NASA libraries for Python. When this happens, you get to create your own. 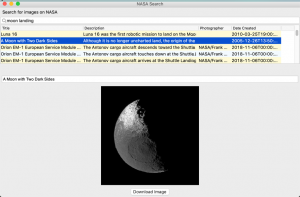 To get started, try reading the NASA Images API document. Their API documentation isn’t very long, so it shouldn’t take you very long to read or at least skim it. The next step is to take that information and try playing around with their API. If you run this in a debugger, you can print out the JSON that is returned. "Apollo 11's first human "
Now that you know what the format of the JSON is, you can try parsing it a bit. This will extract the first item in the list of items from the JSON response. Then you can extract the nasa_id, which is required to get all the images associated with this particular result. Now you can add that nasa_id to a new URL end point and make a new request. The last two lines in your Python code will extract the URLs from the JSON. Now you have all the pieces you need to write a basic user interface! There are many different ways you could design your image downloading application. You will be doing what is simplest as that is almost always the quickest way to create a prototype. The nice thing about prototyping is that you end up with all the pieces you will need to create a useful application. Then you can take your knowledge and either enhance the prototype or create something new with the knowledge you have gained. Let’s learn how to create this user interface now! Rapid prototyping is an idea in which you will create a small, runnable application as quickly as you can. Rather than spending a lot of time getting all the widgets laid out, let’s add them from top to bottom in the application. This will give you something to work with more quickly than creating a series of nested sizers will. Here you import a few new items that you haven’t seen as of yet. The first is the requests package. This is a handy package for downloading files and doing things on the Internet with Python. Many developers feel that it is better than Python’s own urllib. You will need to install it to use it though. You will also need to instal ObjectListView. The other piece that is new are the imports from urllib.parse. You will be using this module for encoding URL parameters. Lastly, the DownloadDialog is a class for a small dialog that you will be creating for downloading NASA images. The Result class is what you will be using to hold that data that makes up each row in your ObjectListView. The item parameter is a portion of JSON that you are receiving from NASA as a response to your query. In this class, you will need to parse out the information you require. Some of these items aren’t always included in the JSON response, so you will use the dictionary’s get() method to return an empty string in those cases. The MainPanel is where the bulk of your code will be. Here you do some housekeeping and create a search_results to hold a list of Result objects when the user does a search. You also set the max_size of the thumbnail image, the font to be used, the sizer and you get some StandardPaths as well. Here you create a header label for the application using wx.StaticText. Then you add a wx.SearchCtrl, which is very similar to a wx.TextCtrl except that it has special buttons built into it. You also bind the search button’s click event (EVT_SEARCHCTRL_SEARCH_BTN) and EVT_TEXT_ENTER to a search related event handler (on_search). This code sets up the ObjectListView in much the same way as some of my other articles use it. You customize the empty message by calling SetEmptyListMsg() and you also bind the widget to EVT_LIST_ITEM_SELECTED so that you do something when the user selects a search result. These final few lines of code add a title text control and an image widget that will update when a result is selected. You also add a download button to allow the user to select which image size they would like to download. NASA usually gives several different versions of the image from thumbnail all the way up to the original TIFF image. Here you call GetSelectedObject() to get the user’s selection. If the user hasn’t selected anything, then this method exits. On the other hand, if the user has selected an item, then you instantiate the DownloadDialog and show it to the user to allow them to download something. The on_search() event handler will get the string that the user has entered into the search control or return an empty string. Assuming that the user actually enters something to search for, you use NASA’s general search query, q and hard code the media_type to image. Then you encode the query into a properly formatted URL and use requests.get() to request a JSON response. Next you attempt to loop over the results of the search. Note that is no data is returned, this code will fail and cause an exception to be thrown. But if you do get data, then you will need to parse it to get the bits and pieces you need. You will skip items that don’t have the title field set. Otherwise you will create a Result object and add it to the search_results list. At the end of the method, you tell your UI to update the search results. Once again, you get the selected item, but this time you take that selection and update the title text control with the selection’s title text. Then you check to see if there is a thumbnail and update that accordingly if there is one. When there is no thumbnail, you set it back to an empty image as you do not want it to keep showing a previously selected image. The update_image() accepts a URL as its sole argument. It takes this URL and splits off the filename. Then it creates a new download location, which is the computer’s temp directory. Your code then downloads the image and checks to be sure the file saved correctly. If it did, then the thumbnail is loaded using the max_size that you set; otherwise you set it to use a blank image. The last couple of lines Refresh() and Layout() the panel so that the widget appear correctly. 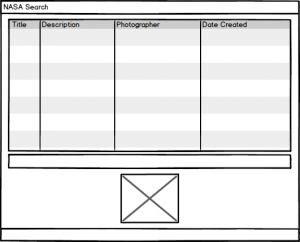 Here you create the frame, set the title and initial size and add the panel. Then you show the frame. Now let’s learn what goes into making a download dialog! 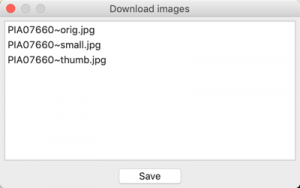 The download dialog will allow the user to download one or more of the images that they have selected. There are almost always at least two versions of every image and sometimes five or six. Here you once again import requests and set up a wildcard that you will use when saving the images. In this example, you create a new reference to StandardPaths and add a wx.ListBox. The list box will hold the variants of the photos that you can download. It will also automatically add a scrollbar should there be too many results to fit on-screen at once. You call get_image_urls with the passed in selection object to get a list of urls. Then you loop over the urls and extract the ones that have jpg in their name. This does result in you missing out on alternate image files types, such as PNG or TIFF. This gives you an opportunity to enhance this code and improve it. The reason that you are filtering the URLs is that the results usually have non-image URLs in the mix and you probably don’t want to show those as potentially downloadable as that would be confusing to the user. The last widget to be added is the “Save” button. You could add a “Cancel” button as well, but the dialog has an exit button along the top that works, so it’s not required. This event handler is activated when the user presses the “Save” button. When the user tries to save something without selecting an item in the list box, it will return -1. Should that happen, you show them a MessageDialog to tell them that they might want to select something. When they do select something, you will show them a wx.FileDialog that allows them to choose where to save the file and what to call it. Here you get the selection again and use the requests package to download the image. Note that there is no check to make sure that the user has added an extension, let along the right extension. You can add that yourself when you get a chance. Anyway, when the file is finished downloading, you will show the user a message letting them know. If an exception occurs, you can show them a dialog that let’s them know that too! Now let’s add some new functionality! There are several fields that you can use to help narrow your search. However you don’t want to clutter your user interface with them unless the user really wants to use those filters. To allow for that, you can add an “Advanced Search” option. Adding this option requires you to rearrange your code a bit, so let’s copy your nasa_search_ui.py file and your download_dialog.py module to a new folder called version_2. Let’s go over each of these separately. The main module is your primary entry point for your application. An entry point is the code that your user will run to launch your application. It is also the script that you would use if you were to bundle up your application into an executable. It also uses pubsub to subscribe to an update topic. Here you add the title for the page along with the search control widget as you did before. You also add the new Advanced Search button and use a new sizer to contain the search widget and the button. You then add that sizer to your main sizer. In this example, you instantiate the RegularSearch and the AdvancedSearch panels. Since the RegularSearch is the default, you hide the AdvancedSearch from the user on startup. The on_search() method will get called when the user presses “Enter / Return” on their keyboard or when they press the search button icon in the search control widget. If the user has entered a search string into the search control, a search query will be constructed and then sent off using pubsub. When on_advanced_search() fires, it hides the search widget, the regular search panel and the advanced search button. Next, it shows the advanced search panel and calls Layout() on the main_sizer. This will cause the panels to switch out and resize to fit properly within the frame. The update_ui() method is called when the user does an Advanced Search. This method is invoked by pubsub. It will do the reverse of on_advanced_search() and un-hide all the widgets that were hidden when the advanced search panel was shown. It will also hide the advanced search panel. The frame code is the same as it was before, so it is not shown here. Let’s move on and learn how the regular search panel is created! The regular_search module is your refactored module that contains the ObjectListView that will show your search results. It also has the Download button on it. Here you have all the imports you had in the original nasa_search_ui.py script from version_1. You also have the base_url that you need to make requests to NASA’s image API. The only new import is for pubsub. This code will initialize the search_results list to an empty list and set the max_size of the image. It also sets up a sizer and the ObjectListView widget that you use for displaying the search results to the user. The code is actually quite similar to the first iteration of the code when all the classes were combined. The first item here is to add a spacer to the main_sizer. Then you add the title and the img related widgets. The last widget to be added is still the download button. The reset_image() method is for resetting the wx.StaticBitmap back to an empty image. This can happen when the user uses the regular search first, selects an item and then decides to do an advanced search. Resetting the image prevents the user from seeing a previously selected item and potentially confusing the user. The load_search_results() method is called using pubsub. Both the main and the advanced_search modules call it by passing in a query dictionary. Then you encode that dictionary into a formatted URL. Next you use requests to send a JSON request and you then extract the results. This is also where you call reset_image() so that when a new set of results loads, there is no result selected. Now you are ready to create an advanced search! 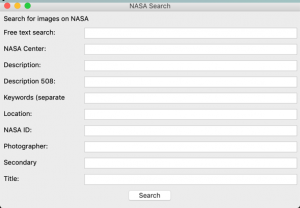 The advanced_search module is a wx.Panel that has all the widgets you need to do an advanced search against NASA’s API. If you read their documentation, you will find that there are around a dozen filters that can be applied to a search. The code to set up the various filters is all pretty similar. You create a text control for the filter, then you pass it into ui_helper() along with a string that is a label for the text control widget. Repeat until you have all the filters in place. At the end, you set the sizer to the main_sizer. Note that not all the filters that are in NASA’s API are implemented in this code. For example, I didn’t add media_type because this application will be hard-coded to only look for images. However if you wanted audio or video, you could update this application for that. I also didn’t include the year_start and year_end filters. Feel free to add those if you wish. The ui_helper() takes in label text and the text control widget. It then creates a wx.BoxSizer and a wx.StaticText. The wx.StaticText is added to the sizer, as is the passed-in text control widget. Finally the new sizer is added to the main_sizer and then you’re done. This is a nice way to reduce repeated code. When the user presses the Search button, this event handler gets called. It creates the search query based on what the user has entered into each of the fields. Then the handler will send out two messages using pubsub. The first message will update the UI so that the advanced search is hidden and the search results are shown. The second message will actually execute the search against NASA’s API. Now let’s update the download dialog. The download dialog has a couple of minimal changes to it. Basically you need to add an import of Python’s os module and then update the save() function. This code was added to account for the case where the user does not specify the extension of the image in the saved file name. This article covered a lot of fun new information. You learned one approach for working with an open API that doesn’t have a Python wrapper already around it. You discovered the importance of reading the API documentation and then added a user interface to that API. Then you learned how to parse JSON and download images from the Internet. While it is not covered here, Python has a json module that you could use as well. You could use threads to download the thumbnails and the larger images as well as for doing the web requests in general. This would improve the performance of your application. You may have noticed that the application became slightly unresponsive, depending on your Internet connectivity. This is because when it is doing a web request or downloading a file, it blocks the UI’s main loop. You should give threads a try if you find that sort of thing bothersome. PyPy2.7, which is an interpreter supporting the syntax and the features of Python 2. PyPy3.6-beta: the second official release of PyPy to support 3.6 features. The PyPy3.6 release is rapidly maturing, but is still considered beta-quality. For a time this configuration worked great, but as the system got more complex, I began to see more and more thread-locking which crashed the entire system from time-to-time. As a result, the system was rewritten to use Gevent, and the UDP broadcast system was replaced by ZeroMQ to ensure the packets were always received. Generation 2, which will be available soon within the repo has many new features which were written during 2018 and partly this year. This system is the one which is currently in-use, however it will be replaced eventually with a newer idea. If you wanted to check out the source code for my custom made home automation system, which is built in Python, you can find it on BitBucket here: Home Automation source code. The code is licensed under the GPLv2. In this article, I describe how we solve this problem with GitLab, Conda and a few other tools. You can find all code and examples referenced in this article under gitlab.com/ownconda. These tools and examples are using the own prefix in order to make a clear distinction between our own and third-party code. I will not necessarily update and fix the code, but it is released under the Blue Oak license so you can copy and use it. Any feedback is welcome, nonetheless. The package manager: Pip or Conda? In this section I’ll briefly explain the reasons why we are using GitLab and Conda. Though you could use private repositories from one of the well-known cloud services, you should probably use a self-hosted service to retain full control over your code. In some countries it may even be forbidden to use a US cloud service for your organization’s data. There are plenty of competitors in this field: GitLab, Gitea, Gogs, Gitbucket or Kallithea—just to name a few. The only tool that (currently) meets these requirements is GitLab. It has a lot more features that are very useful for an organization wide use, e.g., LDAP and Kerberos support, issue labels and boards, Mattermost integration or Git LFS support. And—more importantly—it also has a really nice UX and is one of the few pieces of software that I actually enjoy using. GitLab has a free core and some paid versions that add more features and support. Pip is the official package installer for Python. It supports Python source distributions and (binary) Wheel packages. Pip only installs files in the current environment’s site-packages directory and can optionally create entry points in its bin directory. You can use Virtualenv to isolate different projects from another, and Devpi to host your own package index. Devpi can both, mirror/cache PyPI and store your own packages. The Python packaging ecosystem is overlooked by the Python Packaging Authority working group (PyPA). Conda stems from the scientific community and is being developed by Anaconda. In contrast to Pip, Conda is a full-fledged package manager similar to apt or dnf. Like virtualenv, Conda can create isolated virtual environments. Conda is not directly compatible with Python’s setup.py or pyproject.toml files. Instead, you have to create a Conda recipe for every package and build it with conda-build. This is a bit more involved because you have to convert every package that you find on PyPI, but it also lets you patch and extend every package. With very little effort you can create a self-extracting Python distribution with a selection of custom packages (similar to the Miniconda distribution). Conda-forge is a (relatively) new project that has a huge library of Conda recipes and packages. However, if you want full control over your own packages you may want to host and build everything on your own. Both, Conda and pip, allow you to host your own packages as well as 3rd party packages inside your organization. Both, Conda and pip, provide isolated virtual environments. Conda can package anything (Python, C-libraries, Rust apps, …) while Pip is exclusively for Python packages. With Conda, you need to package and build everything on your own. Even packages from PyPI need to be re-packaged. On the other side, this makes it easier to patch and extend the package’s source. Due to its larger scope, Conda is slower and more complex than Pip. In the past, even patch releases introduced backwards incompatible changes and bugs that broke our stack. However, the devs are very friendly and usually fix critical bugs quite fast. And maybe we would have had similar problems, too, if we used a Pip based stack. Because we need to package more than just Python, we chose to use Conda. This dates back to at least to Conda v2.1 which was released in 2013. At that time, projects like conda-forge weren’t even in sight. To aid our work with GitLab and Conda, we developed some supplementary tools. I have released a slightly modified version of them, called ownconda tools, alongside with this article. The ownconda tools are a click based collection of commands that reside under the entry point ownconda. Initially, they were only meant to help with the management of recipes for external packages, and with running the build/test/upload steps in our GitLab pipeline. But they have become a lot more powerful by now and even include a GitLab Runner that lets you run your projects’ pipelines locally (including artifacts handling, which the official gitlab-runner cannot do locally). Support tools for local development, CI/CD and Conda packaging. check-for-updates     Update check for external packages in RECIPE_ROOT. ci                    Run a GitLab CI pipeline locally. completion            Print Bash or ZSH completion activation script. develop               Install PATHS in develop/editable mode. gitlab                Run a task on a number of GitLab projects. lint                  Run pylint for PATHS. pylintrc              Print the built-in pylintrc to stdout. pypi-recipe           Create or update recipes for PyPI packages. sec-check             Run some security checks for PATHS. show-updated-recipes  Show updated recipes in RECIPE_ROOT. test                  Run tests in PATHS. update-recipes        Update Conda recipes in RECIPE_ROOT. upload                Upload Conda packages in PKG_DIR. validate-recipes      Check if recipes in RECIPE_ROOT are valid. I will talk about the various subcommands in more detail in later sections. 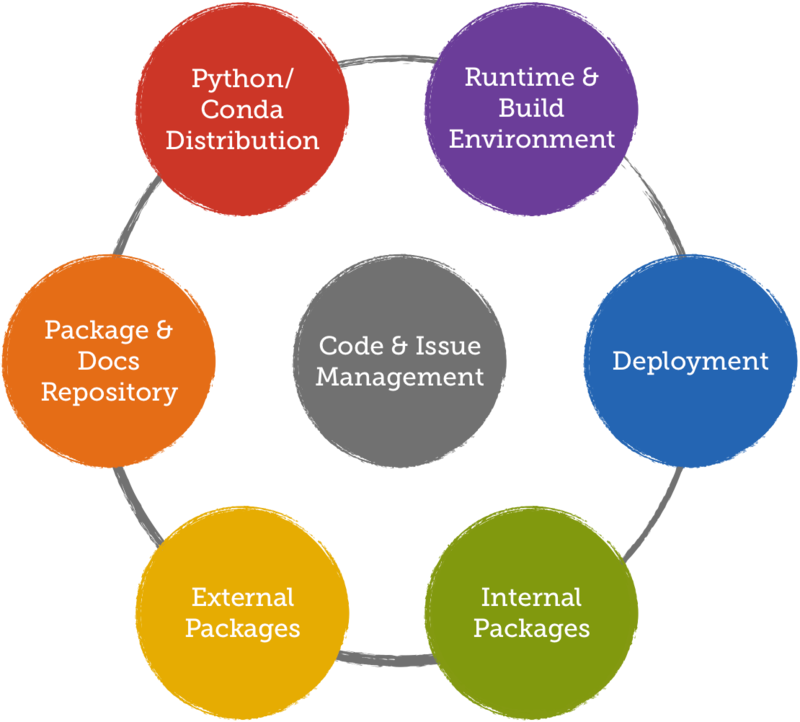 The subject of packaging consists of several components: The platforms on which your code needs to build and run, the package manager and repository, management of external and internal packages, a custom Python distribution, and means to keep an overview over all packages and their dependencies. I will go into detail about each aspect in the following sections. Our packages need to run on Fedora desktop systems and on Centos 7. Packages built on Centos also run on Fedora, so we only have a single build environment: Centos 7. We use different Docker images for our build pipeline and some deployments. The most important ones are centos7-ownconda-runtime and centos7-ownconda-develop. The former only contains a minimal setup to install and run Conda packages while the latter includes all build dependencies, conda-build and the ownconda tools. If your OS landscape is more heterogeneous, you may need to add more build environments which makes things a bit more complicated—especially if you need to support macOS or even Windows. To build Docker images in our GitLab pipelines, we use docker-in-docker. That means that the GitLab runners start docker containers that can access /var/run/dockers.sock to run docker build. GitLab provides a Docker registry that allows any project to host its own images. However, if a project is private, other project’s pipelines can not access these images. For this reason, we have decided to serve Docker images from a separate host. We re-package all external dependencies as Conda packages and host them in our own Conda repository. We can prohibit installing Software from other sources than our internal Conda repository. If users want to depend on new libraries, we can propose alternatives that we might already have on our index. This keeps our tree of dependencies a bit smaller. We cannot accidentally depend on packages with “bad” licenses. We can add patches to fix bugs or extend the functionality of a package (e.g., we added our internal root certificate to Certifi). We can reduce network traffic to external servers and are less dependent on their availability. We can either put the recipe for every package into its own repository (which is what conda-forge does) or use a single repository for all recipes (which is what we are doing). The multi-repository approach makes it easier to only build packages that have changed. It also makes it easier to manage access levels if you have a lot of contributors that each only manage a few packages. The single-repository approach has less overhead if you only have a few maintainers that take care of all the recipes. To identify updated packages that need re-building, we can use ownconda’s show-updated-recipes command. With Conda, we can (and must) decide whether we want to link against system packages (e.g., installed with yum or use other Conda packages to satisfy a package’s dependencies. One extreme would be to only build Python packages on our own and completely depend on system packages for all C libraries. The other extreme would be to build everything on our own, even glibc and gcc. The former has a lot less overhead but becomes the more fragile the more heterogeneous your runtime environments become. The latter is a lot more complicated and involved but gives you more control and reliability. We decided to take the middle ground between these two extremes: We build many libraries on our own but rely on the system’s gcc, glibc, and X11 libraries. This is quite similar to what the manylinux standard for Python Wheels does. Recipes must list the system libraries that they link against. The rules for valid system libraries are encoded in ownconda validate-recipes and enforced by conda-build’s –error-overlinking option. Recipes for Python packages can easily be created with ownconda pypi-recipe. This is similar to conda skeleton pypi but tailored to our needs. Recipes for other packages have to be created manually. We also implemented an update check for our recipes. Every recipe contains a script called update_check.py which uses one of the update checkers provided by the ownconda tools. $ own check-for-updates --verbose . Our Conda repository has various channels for packages of different maturity, e.g. experimental, testing, staging, and stable. Updates are first built locally and uploaded to the testing channel for some manual testing. If everything goes well, the updates are committed into the develop branch, pushed to GitLab and uploaded to the staging channel. We also send a changelog around to notify everyone about important updates and when they will be uploaded into the stable channel. After a few days in testing, the updates are merged into the master branch and upload to the stable channel for production use. This is a relatively save procedure which (usually) catches any problems before they go into production. You can find the recipes for all packages required to run the ownconda tools here. As a bonus, I also added the recipes for NumPy and PyQt5. Internal packages are structured in a similar way to most projects that you see on PyPI. We put the source code into src, the pytest tests into tests and the Sphinx docs into docs. We do not use namespace packages. They can lead to various nasty bugs. Instead, we just prefix all packages with own_ to avoid name clashes with other packages and to easily tell internal and external packages apart. A project usually contains at least these files and directories. Conda-build runs it to build the Conda package. ownconda develop runs it to install the package in editable mode. ownconda develop also creates/updates a Conda environment for the current project and installs all requirements that it collects from the project’s recipe. ownconda build builds the package. ownconda upload uploads the package to the package index. 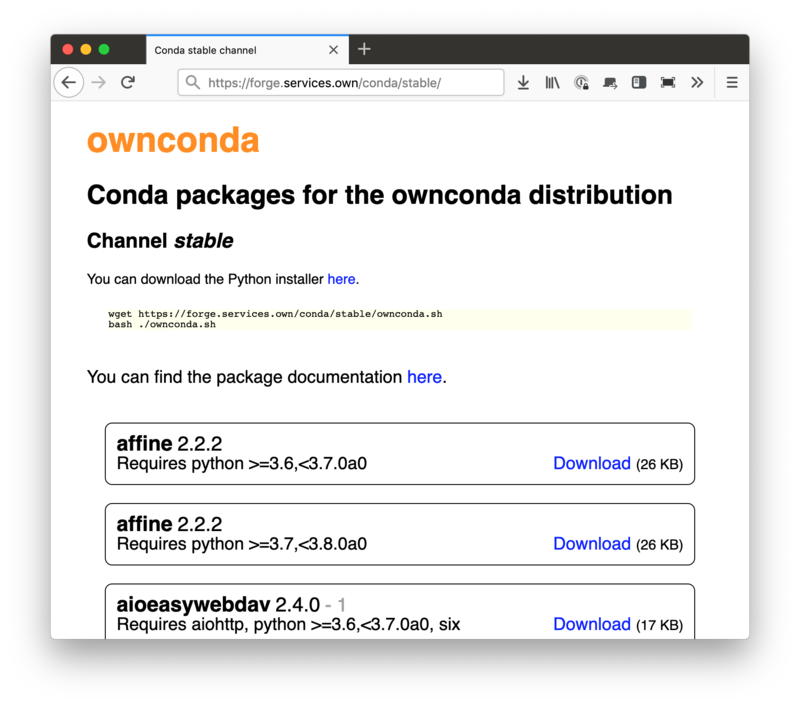 ownconda make-docs builds and uploads the documentation. Development happens in a develop branch. Builds from this branch are uploaded into a staging Conda channel. Larger features can optionally branch of a feature branch. Their builds are not uploaded into a public Conda channel. Stable develop states get merged into the master branch. Builds are uploaded into our stable Conda channel. The required values are automatically exported by Conda and GitLab as environment variables. Hosting a Conda repository is very easy. In fact, you can just run python -m http.server in your local Conda base directory if you previously built any packages. You can then use it like this: conda search --override-channels --channel=http://localhost:8000/conda-bld PKG. A Conda repository consists of one or more channels. Each channel is a directory that contains a noarch directory and additional platform directories (like linux-64). You put your packages into these directories and run conda index channel/platform to create an index for each platform (you can omit the platform with newer versions of conda-build). The noarch directory must always exist, even if you put all your packages into the linux-64 directory. The upload service (for packages created in GitLab pipelines) resides under https://forge.services.own/upload/<channel>. It is a simple web application that stores the uploaded file in channel/linux-64 and runs conda index. For packages uploaded to the stable channel, it also creates a hard link in a special archive channel. Every week, we prune our channels with ownconda prune-index. In case that we accidentally prune too aggressively, we have the option to restore packages from the archive. We also host our own Read the Docs like service. GitLab pipelines can upload Sphinx documentation to https://forge.services.own/docs via ownconda make-docs. The server name forge does not refer to conda-forge but to SourceForge.net, which was quite popular back in the days. With Constructor, you can easily create your own self-extractable Python distribution. These distributions are similar to miniconda, but you can customize them to your needs. A constructor file is a simple YAML file with some meta data (e.g., the distribution name and version) and the list of packages that should be included. You can also specify a post-install script. The command constructor <distdir>/construct.yaml will then download all packages and put them into a self extracting Bash script. We upload the installer scripts onto our Conda index, too. 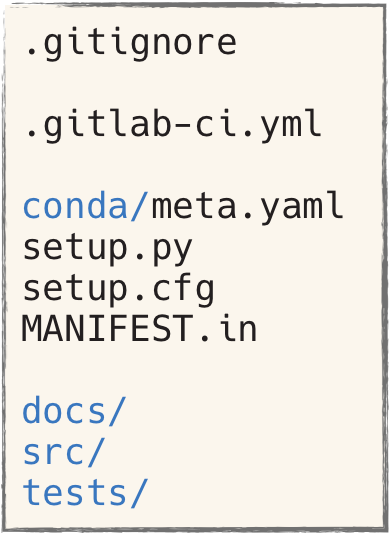 Instead of managing multiple construct.yaml files manually, we create them dynamically in a GitLab pipeline which makes building multiple similar distributions (e.g., for different Python versions) a bit easier. We are currently on the road from copy-stuff-with-fabric-to-vms to docker-kubernetes-yay-land. I am not going to go too much into detail here—this topic is not directly related to packaging and worth its own article. Most of our deployments are now Ansible based. Projects contain an ansible directory with the required playbooks and other files. Shared roles are managed in a separate ownsible project. 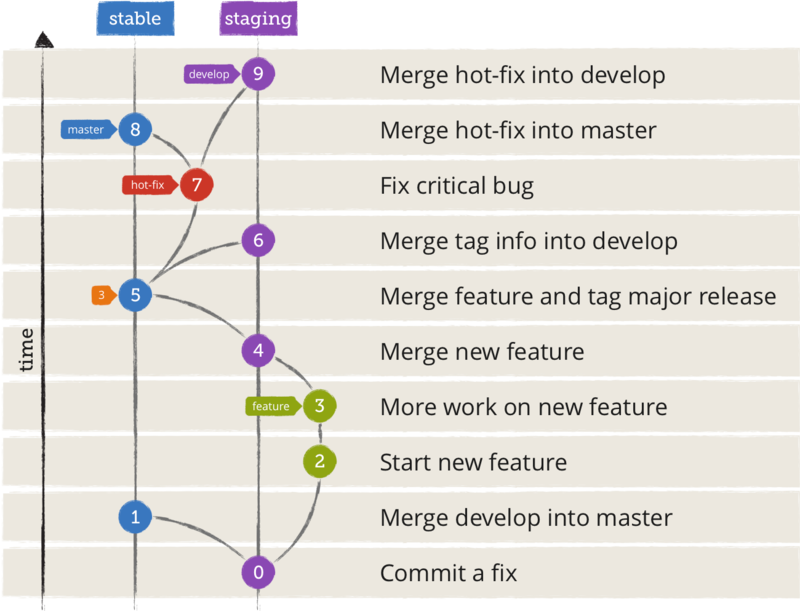 The ansible deployments are usually part of the GitLab CI/CD pipeline. Some are run automatically, some need to be triggered manually. Some newer projects are already using Docker based deployments. Docker images are built as part of the pipeline and uploaded into our Docker registry from which they are then pulled for deployments. It is very helpful if you can build a dependency graph of all your packages. Not only can it be used to build all packages in the correct order (as we will shortly see), but visualizing your dependencies may also help you to improve your architecture, detect circular dependencies or unused packages. The command ownconda dep-graph builds such a dependency graph from the packages that you pass to it. It can either output a sorted list of packages or a DOT graph. Since the resulting graph can become quite large, there are several ways to filter packages. For example, you can only show a package’s dependencies or why the package is needed. Now that you know the theory of how everything should work, we can start to bootstrap our packaging infrastructure. Install GitLab. I’ll assume that it will be available under https://git.services.own. In your www root, create a conda folder which will contain the channels and their packages. Create the upload service that copies files sent to /upload/channel into www-root/conda/channel/linux-64 and calls conda index. Setup a Docker registry on the server. The script might fail to build some packages. The most probable causes are HTTP timeouts or unavailable servers. Just re-run the script and hope for the best. If the issue persists, you might need to fix the corresponding Conda recipe, though (Sometimes, people re-upload a source archive and thereby change its SHA256 value). Create a GitLab pipeline for the centos7-ownconda-runtime project. This will generate your runtime Docker image. When the runtime image is available, create a GitLab pipeline for the centos7-ownconda-develop project. This will generate your development Docker image used in your projects’ pipelines. Create a GitLab pipeline for the external-recipes project to build and upload the remaining 3rd party packages. If a pipeline fails and the script aborts, just remove the successful projects from the projects.txt and re-run the for loop. Congratulations, you are done! You have built all internal and external packages, you have created your own Conda distribution and you have all Docker images that you need for running and building your packages. Managing your organization’s packaging infrastructure like this is a whole lot of work but it rewards you with a lot of independence, control and flexibility. We have been continuously improving our process during the last years and still have a lot of ideas on our roadmap. While, for example, GitLab has a very good authentication and authorization system, our Conda repository lacks all of this (apart from IP restrictions for uploading and downloading packages). We do not want users (or automated scripts) to enter credentials when they install or update packages, but we are not aware of a (working) password-less alternative. Combining Conda with Kerberos might work in theory, but in practice this is not yet possible. Currently, we are experimenting with HTTPS client certificates. This might work well enough but it also doesn’t seem to be the Holy Grail of Conda Authorization. Another big issue is creating more reproducible builds and easier rollback mechanisms in case an update ships broken code. Currently, we are pinning the requirements’ versions during a pipelines test stage. We are also working towards dockerized Blue Green Deployments and are exploring tools for container orchestration (like Kubernetes). On the other hand, we are still delivering GUI applications to client workstations via Bash scripts … (this works quite well, though, and provides us with a good amount of control and flexibility). We are also still having an eye on Pip. Conda has the biggest benefits when deploying packages to VMs and client workstations. The more we use docker, the smaller the benefit might become, and we might eventually switch back to Pip. But for now, Conda serves us very well. You can leave comments and suggestions at Hackernews and Reddit or reach me via Twitter and Mastodon. # Make sure that the first number is even. [count:2] Hey! I am back!! [count:1] Hey! I am back!! >>> """ We get the generator iterator """
>>> """ When next() is called, the function executes till the first yield statement """
>>> """ When next() is called again, it picks up where it left off and executes till the next yield statement """
>>> """ When there are no more yields, calling next() raises StopIteration """
statsd, a "Daemon for easy but powerful stats aggregation"
or any other statsd capable monitoring engine. using MQTT and pytest-play, using YAML files. Sheldon: Someone in Sezchuan province, China is using his computer to turn our lights on and off. Penny: Huh, well that’s handy. Um, here's a question... why?! All together: Because we can! avoid false alarms like a generic "today the system seems slower". If there is a confirmed problem you might say instead: "compared to previous measurements, the system response is 0.7 s slower today. Systematically." What should you measure? Everything of valuable for you:. MQTT is a machine-to-machine (M2M)/"Internet of Things" connectivity protocol. It was designed as an extremely lightweight publish/subscribe messaging transport. is available on many cloud infrastructures. Every actor can publish a message for a certain topic and every actor can subscribe to a set of topics, so you get a message for every message of interest. Topics are hierarchical so that you can subscribe to a very specific or wide range of topics coming from devices or sensors (e.g., /house1/room1/temp, /house1/room1/humidity or all messages related to /house1/room1/ etc). server will be notified for any device response or communication subscribing to a particular topic (e.g., project1/DEVICE_SN/data). you expect responses subscribing to foo/bar/DEVICE_SN/data. $ mosquitto_pub -t foo/bar -h iot.eclipse.org -m "hello pytest-play!" pytest-play is multi platform because it is based on Python (installation might be different for different operative system). As a user you should be confident with a shell and command line options. And now let's start with our example. Create a new folder (e.g., fridge) and enter inside. You can have one or more configuration files defining variables for your convenience. Typically you have one configuration file or each target environment (e.g., dev.yml, alpha.yml, etc). We will use later this file for passing variables thanks to the --variables env.yml command line option, so you can switch environment passing different files. Create a a YAML file called test_light_on.yml inside the fridge folder or any other subfolder if any. Note well: the *.yml extension and test_ prefix matter otherwise the file won't be considered as executable at this time of writing. where 244 stands for the internal ModBUS registry reference for the fridge light and 1 stands for ON (and 0 for OFF). Let's comment command by command and section by section the above YAML configuration. You can mark your scripts with one or more markers so that you can select which scenario will run from the command line using marker expressions like -m light_off or something like -m "light_off and not slow" assuming that you have some script marked with the pretend slow marker. Assume that you have 2 or more real devices providing different firmware versions always ready to be tested. If you want you can track different metrics for different serial numbers so that you are able to compare different firmware versions. you can subscribe to one or more topics using the mqtt provider and type: subscribe. You have to provide the where the MQTT broker host lives (e.g., iot.eclipse.org), the port, obviously the topic you want to subscribe (e.g., foo/bar/$device_serial_number/data/light where $device_serial_number will be replaced with what you define in environment configuration files or for each test_data section. This is a non blocking call so that while the flow continues, it will collect underground every message published on the topics of our interest storing them to a messages variable. messages is an array containing all matching messaging coming from MQTT and you can access to the messages value in expressions with variables["messages"]. where 244 is the internal reference and 1 stands for ON. The time metric will be available under a variable name called in our example response_time (from name: response_time). For a full set of metrics related commands and options see https://github.com/pytest-dev/pytest-play. You can specify a timeout (e.g., timeout: 12), a poll time (how many wait seconds between a while iteration, in such case poll: 0.1) and an optional list of while's sub commands (not needed for this example). When the expression returns a true-ish value, the while command exits. In the above example we are iterating over our array obtaining only the entries with a given measure_id where the loads is a builtin JSON parse (python's json.loads). Remember that the messages variables is an array of string messages? We are taking the first message (with variables["messages"] you get the first raw payload), parse the JSON payload so that assertions will be simpler (in our case loads(variables["messages"]) for sake of completeness) obtaining a dictionary and then assert that we have the expected values under certain dictionary keys. variables["something"] == "yet another value"
One line protected Python-based expressions let you express any kind of waiters/assertions without having the extend the framework's commands syntax introducing an exotic YAML-based meta language that will never be able to express all the possible use cases. The basic idea behind Python expressions is that even for non programmers it is easier to learn the basics of Python assertions instead of trying to figure out how to express assertions in an obscure meta language. pytest-play is not related to MQTT only, it let you write actions and assertions against a real browser with Selenium, API/REST, websockets and more. So if you have to automate a task for a device simulator, a device driver, some simple API calls with assertions, asynchronous wait for a condition is met with timeouts or interact with browsers, cross technology actions (e.g., publish a MQTT message and poll a HTTP response until something happens) and decoupled test data parametrization... even if you are not a programmer because you don't have to deal with imports, function or class definitions and it is always available if you have Docker installed. 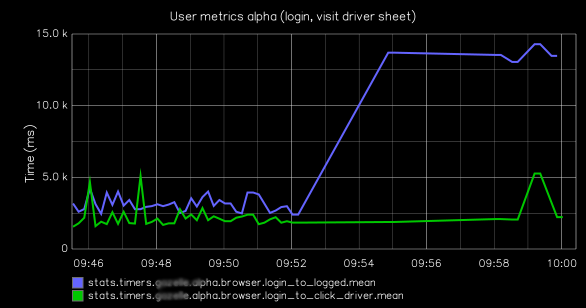 And now you can show off with shining metrics! Let's get in touch for any suggestion, contribution or comments. Contributions will be very appreciated too! 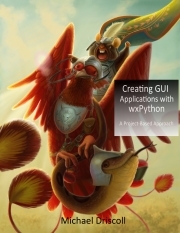 In this issue of Wing Tips we take a look at how to use the Anaconda Distribution of Python with Wing. To use the Anaconda with Wing, simply set the Python Executable used in your Wing project to Anaconda's python or python.exe. How you do this depends on whether you are creating a new project or have an existing project that you want to modify. To create a new Wing project that uses Anaconda, select New Project from the Project menu and then under Python Executable select Custom and enter the full path to Anaconda's python or python.exe. Shown Above: Choose "New Project" from the "Project Menu", select "Custom" for "Python Executable", find Anaconda in the drop down menu, and press "OK" to create the new project. To change an existing project to use Anaconda Python, the steps are the same as above except that the change is made under Project Properties in the Project menu. If you are using virtualenv with Anaconda, use the full path of the virtualenv's python.exe or python instead. When in doubt, you can print sys.executable as already described to find the correct full path to use in Wing's Python Executable configuration. In most cases, that is all that you need to do. Wing will start using your Anaconda installation immediately for source intelligence, for the next debug session, and in the integrated Python Shell after it is restarted from its Options menu. On Windows, Anaconda may fail to load DLLs when its python.exe is run directly from the command line or within Wing. This is due to the fact that by default the Anaconda installer no longer sets the PATH that it needs to run, in order to avoid conflicting with different Python installations on the same system. A simple solution to fix this problem is to run Scripts\activate (located within your Anaconda installation) on the command line, and then start Wing from within the activated environment, for example with c:\Program Files (x86)\Wing Pro 7\bin\wing.exe. This causes Wing to inherit the necessary PATH that was set up by Anaconda's activate script. This solution works well if you will be using the same Anaconda installation for all projects that you open in a session. If you change to projects that use a different Python installation, you will need to quit and restart Wing in the correct environment. Our recommended solutions require a bit more work up front, but once in place they automatically set the necessary PATH without the potential for polluting other Python installations with unwanted environment. Then set Python Executable in Wing's Project Properties to the full path of this batch file. This sets up the necessary environment and then runs Anaconda's Python. No other configuration is necessary, and this script can also be used on the command line or in other IDEs. Again, you may need to change the value of ANACONDA_DIR to match where Anaconda is installed on your system. Both of these solutions work well if there are multiple Python installations on your system, because it ensures that the correct PATH is always set when the project is open, allowing other projects to use a different environment. That's it for now! In next week's Wing Tips we'll get back to looking at some of the lesser-known but useful features in Wing. Canceling the subscription with Stripe. Marking the user as inactive. Sending the user to a friendly page to indicate that their account is deactivated. The recording is available on YouTube and the full transcript is below. Update python modules of 3.73 version. Because of the complexity of the question we will need to create two methods, the first one will accept the list input and then the second one will do the real factorial calculation, then we will sum the factorials up in the first method. That will do the job! In the next coming article, I will start to write about my python journey because I believe you have seen enough coding and want some interesting python programming related story series. And next month we will start a new python project together. Follow me on Twitter or share this post if you want to. If you really like this post don’t forget to consider to donate 1 dollar to help this site out! Someone recently asked how to permanently change the prompt in the Python interactive REPL. The answer is you can point the PYTHONSTARTUP environment variable at a Python file, and that file will be executed every time you enter the interactive prompt. I use this to import modules I often want to use, define helpers, and configure my command history. # Ned's startup.py file, loaded into interactive python prompts. # A function for pasting code into the repl. # Not sure why this module is missing in some places, but deal with it. # Don't do history stuff if we are IPython, it has its own thing. # Get rid of globals we don't want. A few things could us an explanation. The paste() function lets me paste code into the REPL that has blank lines in it, or is indented. Basically, I can copy code from somewhere, and use paste() to paste it into the prompt without having to fix those things first. Run paste(), then paste the code, then type an EOF indicator (Ctrl-D or Ctrl-Z, depending on your OS). The pasted code will be run as if it had been entered correctly. The history stuff gives me history that persists across Python invocations, and keeps the Python 2 history separate from the Python 3 history. “pp” is very handy to have as a short alias. Of course, you can put anything you want in your own .startup.py file. It’s only run for interactive sessions, not when you are running programs, so you don’t have to worry that you will corrupt important programs.